Store Hours: M-F 12PM-8PM, Sat 12-6PM, Sunday by appointment. 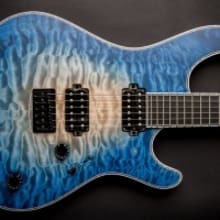 Brands we sell: Bare Knuckle Pickup, Charvel, Dean, Diamond, DiMarzio, ENGL, ESP, Flaxwood, Framus, GJ2, G&L, Hughes & Kettner, Ibanez, Jackson, James Trussart, Lundgren PIckups, Mayones, Mesa/Boogie, Mezzabarba, Orange, Parker, PRS, Schecter, Soldano, Splawn, Taurus, Warwick, Washburn, and much more! We ship all guitars with UPS Ground (domestic) or UPS/DHL/USPS (international). If you would like to upgrade shipping to 3-day, 2-day, or overnight, you can choose to do so by request. We do everything we can to help save customers money when importing goods, but ultimately we're not responsible for any customs or associated fees your country may assess. All items purchased from us ship out the day same if ordered before 2PM EST, except in cases where special work is requested by the customer (ie: setups, pickup changes, etc). New items come with a 30 day exchange policy, which allows you to exchange the item for another item of equal or lesser value. If an item you want to exchange has a greater value, the difference must be paid to balance things out. For an exchange to be accepted, you must get an authorization from The Axe Palace by contacting us by phone or email. All items must be in their original condition with all the original packaging and included accessories, otherwise an exchange may be refused or a restocking fee issued. All shipping costs will be the responsibility of the buyer. New items allow for a 14 day approval period, wherein you will be allowed to return the item for a full refund if you are dissatisfied for any reason. Refund does not include any shipping costs or associated fees. For an return to be accepted, you must get an authorization from The Axe Palace by contacting us by phone or email. All items must be in their original condition with all the original packaging and included accessories, otherwise the return may be refused or a restocking fee issued. All shipping costs will be the responsibility of the buyer. For all B-Stock, Used, or Blowout Sale items, no returns or exchanges will be allowed unless you receive special permission by us in writing prior to the sale. Of course all said items are guaranteed to be described accurately and function properly, and if not returns will be allowed as long as we're notified within 48 hours of receiving the item. All international sales are final, with no refunds, returns, or exchanges allowed unless you receive special permission by us in writing prior to the sale.